"Where have all my friends gone?" A cockatoo -- and his parrot and cockatiel relatives -- ranks high in the caged bird lovers popularity ratings. His distinctive crest makes him easy to identify, but with so many cockatoo species to choose from, you need to know your Indonesian white from your Australian galah. There is some disagreement in ornithology sources about the exact number of cockatoo species, but the approximate figure is between 18 and 20. This lack of exactitude is largely due to the way the species is classified by ornithologists. Some experts put certain cockatoos into another species class -- cacatuidae -- but the majority of cockatoos belong to the species psittacidae, which is the parrot family. 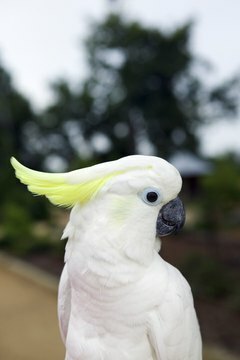 One thing all cockatoo species do have in common is that they all have crests on top of their heads, although these vary in size and flamboyance. The white cockatoo from the Moluccan islands of Indonesia is probably the species that American bird lovers are most familiar with. He is all white, including his crest, with a wash of pale yellow color on his tail and wing feathers. Like most cockatoos, he likes to spend his time with a friend, or group of friends, and he makes a pretty noisy screeching sound, so you'll know he's around. One of the reasons this particular cockatoo species is liked as a pet is because he is easier to handle than some other cockatoos, especially if he is hand-reared by humans. And that makes this snowy bird vulnerable to depopulation in the wild. If you'd like a smaller bird than a white cockatoo, a cockatiel could be the answer. He's a member of the same family, but this Australian flyer is not an endangered species because he is easily bred in captivity. A galah is one of the most distinctive members of the cockatoo family because of his grey body feathers and his deep pink face, neck and underparts. Frequently kept as a pet, particularly in his native Australia, he seems less nervous around people than some other cockatoos. He does have a reputation as an independent thinker, but he's also capable of forming an affectionate bond with whichever owner he chooses as his favorite. And as an added bonus -- as long as he doesn't embarrass you -- the galah is capable of learning to talk. Because cockatoo populations are generally small and they're found in confined areas, it has been easy for trappers and collectors to catch them. As a result, some cockatoo species numbers are at dangerously low levels. The red-vented cockatoo is now the most endangered species in the Philippines. Logging as well as the illegal bird trade has contributed to a 98 percent reduction in the population. However, a ban on trade by the Convention on International Trade on Endangered Species -- such as the one on sales of the salmon-crested cockatoo of Indonesia -- is difficult to enforce. The yellow-crested cockatoo is another endangered species. BirdLife International monitors bird species across the globe, mostly with the help of volunteers. They, and organizations like them, are a good source of help if you are concerned about the status of a cockatoo species you want to buy.